When it comes to finding a home away from home with creature comforts that can only be described as being fit for a king and queen alike, one would certainly struggle to find any place that could rival the grace and beauty that is Lavande de Franschhoek. Situated in the picturesque Winelands of Cape Town and surrounded by rolling fields that just seem to extend as far as the eye can see, Lavender Farm Guest House boasts the honour of being lauded as the only lavender farm in Franschhoek. With a maximum of only eight guests at any given time, you'll soon discover that at the Lavender Farm Guest House, exclusivity is not a word that we simply pay lip service to, it is an ideal that we live by. Check out by 11:00 am.Check in between 14:00 and 17:00 hrs.If you will be arriving after 17:00 hrs, please advise us of this in advance. What a beautiful location. A lovely surprise for my first time here and I hope to be back. Friendly efficient staff , a lovely clean room and a wonderful Vista. Wow! What a beautiful setting to relax and unwind after a full day of wine tasting. The Lavender field ensued a sense of calm and lent itself to taking so many amazing photos. The rooms are superb, spacious and comfortable. Breakfast was tasteful. Just so sorry that we only stayed for one night, would have loved to be able to stay a few nights and enjoy the ambience. 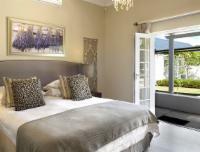 This is the place to stay at, when next in Franschhoek. Incredible incredible incredible incredible!! !No words can describe it you just need to experience it! What I see is what I get and it is only the best! Lavender Farm Guest House is 1.1km from the centre of Franschhoek , the nearest airport 59km (Cape Town International Airport).